Have You Visited London's Tower Bridge? If there’s a more beautiful bridge in the world, we’d like to see it! Tower Bridge is an iconic symbol of London and is one of the most photographed landmarks in the capital. Over 40,000 Londoners and visitors use Tower Bridge every single day and it’s still a treasured part of England’s heritage, nearly 120 years after being built. There was once only one River Thames crossing: London Bridge. This bridge is located a little farther upstream from Tower Bridge and the two are often confused! London Bridge pales in comparison to Tower Bridge – it’s not nearly as beautiful! In the 19th century a new bridge was needed due to the growing London population and in 1876 the City of London Corporation decided to build Tower Bridge. Over 50 bridge designs were submitted for the new structure – you can check these out at the Tower Bridge Exhibition! In October 1884, City Architect Horace Jones’ design was chosen and after eight years and the hard toil of 432 construction workers, Tower Bridge was complete! Today, Tower Bridge is powered by oil and electricity rather than the steam power that was used in the Victorian period. The huge bascules lift the road above up and down to let boats through, bringing the traffic and pedestrians to a standstill! If you’re in London during important national events, you might notice Tower Bridge with a bit of extra decoration! This has been happening for many years; in 1977 Tower Bridge was even painted red, white and blue to celebrate the Queen’s Silver Jubilee! In November 2011, the Bridge was fitted with 1,800 LED lights in preparation for the busy year ahead: the Diamond Jubilee and 2012 Olympics! 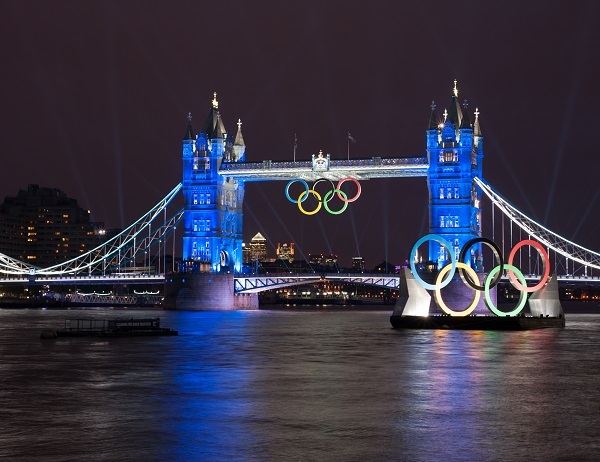 Did you see the Bridge decked out in huge Olympic rings during London 2012? The historic attraction is always kept up to date with the times! If you want to learn more about the building of Tower Bridge and walk across the famous 45 metre high walkways, check out the fantastic Tower Bridge Exhibition. 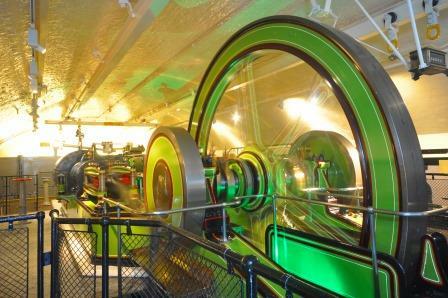 You’ll get an amazing view of London and the River Thames plus get a chance to explore the inside of the Bridge, from the Victorian Engine Rooms to the interactive displays and temporary exhibits! 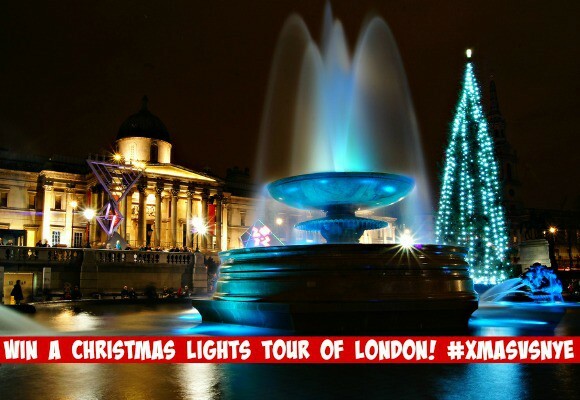 Look out for St. Paul’s Cathedral, Canary Wharf and the London Eye while strolling along the walkways! 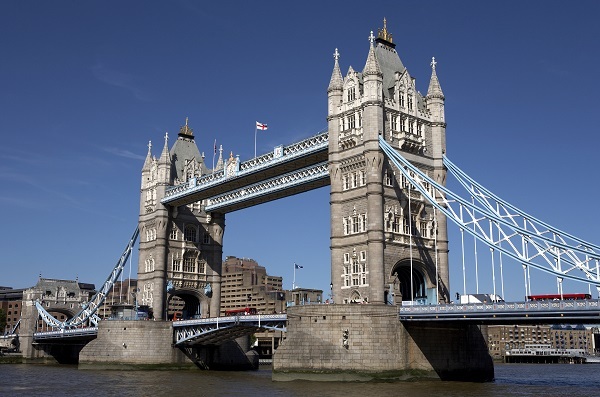 Getting to Tower Bridge is so easy – a hop-on hop-off London bus tour allows you to visit it when you wish and gives you the flexibility to explore some other attractions in the area! Spend as much time as you want to snapping priceless photos of Tower Bridge and hop on a bus when you’re finished!